On 30 March, Vincent Willem van Gogh was born in Zundert, the eldest son of the Protestant clergyman Theodorus van Gogh (1822 - 1885) and Anna Cornelia Carbentus (1819-1907). Birth of his brother Theo on 1 May. Vincent's school career was fragmented: he attended the village school in Zundert for a year, followed by two years at a boarding school in Zevenbergen and eighteen months at the Willem II 'Rijks-HBS' (grammar school) in Tilburg. Van Gogh joined the international art dealer Goupil & Co. in The Hague on 30 July 1869 as a junior apprentice. The manager of the firm was H. G. Tersteeg. Goupil also had branches in Paris, London and Brussels. The lengthy exchange of letters with his younger brother Theo started in August 1872 in The Hague. On 1 January 1873, Theo also joined the staff of Goupil & Co. and was appointed to the Brussels branch. On 13 June, Vincent was posted to Goupil's London branch, where he was to stay until 15 May 1875 - apart from a three-month transfer to Paris. Then, against his will, he was posted permanendy to Paris. His aversion to the art trade grew steadily. He immersed himself in the Bible and lived in seclusion. After his dismissal from Boussod & Valadon, the successors to Goupil, he returned to his parents' home in Etten in 1876. Vincent worked as a teacher at a boarding school in Ramsgate from mid-April 1876 until July, when he moved to a post in Isleworth on the outskirts of London, where he was also allowed to preach occasionally. Lack of opportunities prompted him to return to the Netherlands at Christmas 1876 and he worked briefly in a bookshop in Dordrecht. In May he moved to Amsterdam to prepare himself for theological studies. In May 1878 he gave this up and, after a brief training in Laeken outside Brussels, moved in December to the Borinage region of Belgium, where he worked among the miners as an evangelist. 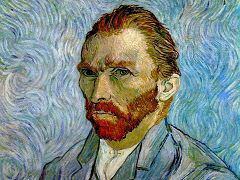 In August 1880, Van Gogh decided to become an artist. To prepare himself, he started copying drawings and reproductions of work by Jean-Francois Millet, the painter of peasant life. He stayed in Brussels in the winter and met the painter Anthon van Rappard there. He received financial support from Theo. In April he returned to live with his parents in Etten. He continued studying, using mainly motifs from peasant life. At the end of November, he spent a few weeks in The Hague working with his cousin by marriage, the painter Anton Mauve, under whose guidance he produced his first water-colours and stilllifes in oils. A bitter altercation around Christmas led to estrangement from his parents. Van Gogh departed for The Hague. In January Van Gogh rented a studio on Schenkweg. Anton Mauve was supportive and also gave Vincent drawing lessons. When Vincent took in his model Sien Hoornik - pregnant, unmarried and with a daughter - and even wanted to marry her, both Mauve and Tersteeg turned their back on him once and for all. His brother Theo continued to support him financially. In March the artist received his first commission: he drew 12 views of The Hague for his uncle, the art dealer 'C. M.'. Several watercolours followed in July. In August, Van Gogh painted studies in a conscious effort to produce work suitable for sale. Hoping to make a living as an illustrator, he made a few lithographs in November. His difficult relationship with Sien and his poverty eventually drove Van Gogh from The Hague. He departed on 11 September for the Dutch province of Drenthe, which was popular among artists at that time. Relations with his parents, though initially very strained, gradually improved. His final decision to become a painter of peasant life dates from this period. He produced numerous studies and watercolours of weavers in January and February. In May he rented a studio where he was to go and live a year later. In August - September he received a commission: he	supplied large designs for six scenes from peasant life for Antoon Hermans, a retired Eindhoven goldsmith, as a decoration for his dining room. In the	autumn, Van Gogh gave lessons in still-life painting to a few amateur artists, leading him to tackle the genre himself. During the winter he painted a series of fifty peasant heads and the idea for The Potato Eaters began to take shape. On 26 March his father died unexpectedly. The final version of Van Gogh's first masterpiece The Potato Eaters was completed in late April and sent to Theo in Paris on 5 May. 'The Country Churchyard' and The Cottage were also completed in May, along with many drawings. In the summer, Van Gogh was busy recording the wheat harvest in numerous drawings. Lack of money prevented him from painting at this time. His supply of models dried up when the local priest forbade his parishioners to pose. The artist then restricted his activities to painting still-lifes and landscapes, gready inspired by his recent visit to the new Rijks Museum in Amsterdam. On 24 November Van Gogh departed for Antwerp. After the quiet village life of Nuenen, the city with its historic buildings and museums was overwhelming; Peter Paul Rubens' colouring and brushstrokes made a particular impression on him. It was here too that Van Gogh learnt to appreciate Japanese prints. In Antwerp he hoped that painting portraits and townscapes could make him financially independent, but the art trade there was severely depressed and success continued to elude him. Models were also hard to come by in Antwerp, so Van Gogh registered at the art academy on 18 January. He soon became engaged in a conflict about his way of drawing. The influence of Japanese prints on his work increased. He collected examples of this art and organised an exhibition of Japanese prints in the cafe Du	Tambourin in March - April. He also made several copies of Japanese prints. In April and May, Van Gogh spent much time painting in Asnieres, in the company of Paul Signac. Vincent painted portraits, townscapes and landscapes in an Impressionistic and Neo-Impressionistic style. In November he organised an exhibition of the artists he called the Tmpressionnistes du Petit Boulevard' and met Seurat, Gauguin, Camille Pissarro and Guillaumin there. Van Gogh showed at least one work, 'The Voyer d'Argenson Park in Asnieres', in the Theatre Libre d'Antoine in December - January, at the same time as work by Seurat and Signac was exhibited. He continued to experiment with colour in his still-lifes, which included the yellow 'Still-Life with Fruit' and the ambitious Romans parisiens. The hectic life he had been leading in Paris began to take its toll: Vincent was weakened both mentally and physically and produced very litde work. In search of peace and a warm climate he decided to leave for Arles in February. The weather in Provence was not much better than in Paris: temperatures were below freezing and there was snow on the ground. In March and April he painted several versions of The Langlois Bridge and devoted a major series of paintings to the subject of fruit trees in blossom. To save money he decided in late April to do more drawings with a reed pen. At Theo's prompting he submitted three canvases for the Salon des Independants. On 1 May he rented four rooms in the Yellow House. He now had a home of his own, but lacked the money to furnish it; he stayed on in cheap lodgings until September. Early in May he sent his first consignment of paintings to Theo. At the beginning of June he paid a five-day visit to the fishing village of Les Saintes-Maries-de-la-Mer. The Mediterranean fascinated him and he made several successful studies and drawings. After his return to Arles he drew on this inspiration for further works, among them Fishing Boats on the Beach. The wheat harvest formed a new subject for a series of canvases, including several large ones such as The Harvest and Stacks of Wheat near a Farmhouse. In June, he also produced The Sower, an attempt at a truly modern figure piece. At last he had an opportunity to paint portraits of characteristic types, starting with The Zouave and continuing with portraits of Joseph Roulin, Patience Escalier, Eugene Boch. He sent fifteen drawings based	on his recent paintings to Emile Bernard in mid-July. In early August he sent twelve similar drawings to John Russell and five to Theo. In mid-August he sent his brother a second consignment of paintings. 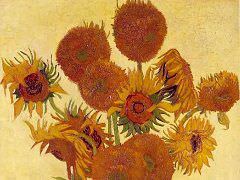 He planned an extensive decorative series for the Yellow House, to include six or twelve still-lifes with sunflowers. He completed four and was to make another three copies of them the following January. Paul Gauguin wrote from Pont-Aven announcing his desire to come to Arles as soon as possible. 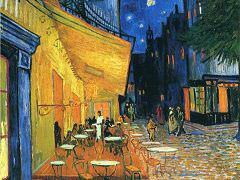 In early September Van Gogh painted The Night Cafe. While waiting for Gauguin, Van Gogh furnished the Yellow House with money from Theo. He moved in on 17 September and painted the view of his new home. He worked on a series of autumn gardens. The Self-Portrait, also dating from September, was intended to	be sent to Bernard and Gauguin in exchange for their self-portraits. Van Gogh again painted a harvest motif, The Green Vineyard. 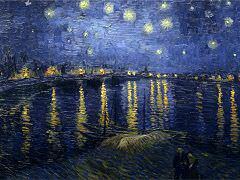 Two night scenes were also completed in this period, Café Terrace at Night and The Starry Night. Despite trouble with his eyes, Van Gogh managed to complete several large canvases in October, among them The	Tarascon Diligence, The Trinquetaille Bridge and The Bedroom. On 23 October Gauguin finally arrived in Arles. Vincent's health improved rapidly and the canvases that soon followed included Les Alyscamps, The Red Vineyard. In mid-November he declined an invitation to exhibit work in the offices of the Revue Independante. At Gauguin's insistence, he tried painting from memory, one of the results being Memory of the Garden in Etten. The portraits of the postman Joseph Roulin and his family were made around the beginning of December. Their conflicting temperaments led to increasing friction between Van Gogh and Gauguin in the course of December. After a dramatic quarrel on 23 December, when Vincent mutilated his ear, Gauguin left for Paris. Vincent was admitted to hospital in Arles. Contrary to expectations, the painter made a rapid recovery, and on 7 January he was able to return home, where he immediately started work again on his Self-portrait among other works. At the end of January, Madame Roulin sat for La Berceuse, of which four copies would be made. Van Gogh painted three copies of the still-life with sunflowers and had in mind a triptych of 'La Berceuse' flanked by these still-lifes. In February, neighbours objected to Vincent's presence in the Yellow House and he was again admitted to hospital. On 23 March, he received a visit from Paul Signac and together they went to the Yellow House. On 17 April, Theo married Johanna Gesina Bonger in Amsterdam. Vincent decided at the end of April to have himself admitted as a voluntary patient to the asylum of Saint-Paul-de-Mausole in nearby Saint-Remy. There he was treated by Dr Peyron, who concluded in the first few months that the patient behaved calmly and that his condition was improving satisfactorily. Van Gogh was allowed to start work inside the asylum; an extra room	was equipped as a studio. 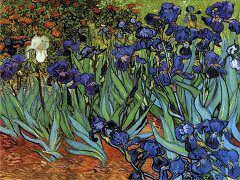 In the garden of the asylum he found countless motifs, including Irises and 'Lilacs'. He also painted and drew the enclosed field which he could see from his window. Sometimes he worked under supervision outside the asylum, where typically Provencal motifs such as olive trees and cypresses served as his subjects. The first version of The Reaper was made in June. 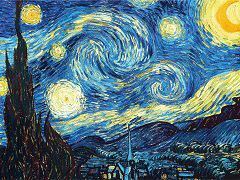 Again he painted a nocturnal scene, 'The Starry Night'. In mid-July he was struck down by another severe attack which persisted until September and made it impossible for him to work. Still weak from his illness he painted several self-portraits and portraits and a copy of 'The Bedroom'. He also completed the replica of 'The Reaper'. Van Gogh was represented at the fifth exhibition of the Societe' des Artistes Inde'pendants in September in Paris, exhibiting two paintings: The Starry Night and Irises. In October - December he portrayed the themes that had by now become so familiar: the enclosed field; views of the garden with pine trees Provencal motifs such as olive groves and The Ravine. In Saint-Remy he painted the Road Works at Saint-Remy on the Boulevard Mirabeau. In this period he also produced a series of colour 'translations' of black and white prints after Millet, Eugene Delacroix and Rembrandt. At the end of December he suffered a new attack, but it lasted only a week. In January he concentrated on painting several large copies after Millet. Van Gogh was invited to take part in the annual exhibition of Les Vingt in Brussels and showed five canvases. At the end of January he again suffered an attack lasting a week. Around 25 January, he received an article by Albert Aurier entided 'Les Isoles: Vincent van Gogh', which had appeared in the Mercure de France. 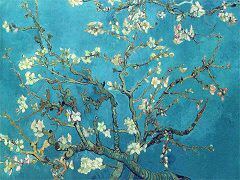 To mark the birth of Theo's son Vincent Willem on 31 January he painted Branches with Almond Blossom. He also produced five portraits of Madame Ginoux, 'L'Arlesienne', based on a drawing by Gauguin. Theo wrote that one of Vincent's paintings Red Vineyards at Arles had been sold in Brussels for 400 francs. After a visit to Arles on 22 February, Van Gogh suffered a further attack which lasted until late April. He carried on working despite his illness, producing numerous sheets of studies with themes from the Nuenen period, which he referred to as 'Souvenirs du Nord'. At the Salon des Independants Van Gogh was represented by ten works selected by Theo. At the end of April he was seized by the urge to leave the asylum as quickly as possible. Before he left he painted several still-lifes, among them Still-Life with Irises, and a last attempt at a nocturnal scene. On his way to Auvers, Vincent visited his brother in Paris and met Theo's wife. He also looked at his older paintings, stored in Theo's apartment and with Pere Tanguy. He journeyed on to Auvers earlier than expected on 20 May. There he placed himself in the care of Paul Gachet, a doctor and amateur artist. The two met regularly and established a close relationship. Van Gogh rented an attic room in Ravoux's inn and was enthusiastic about rustic Auvers. In the first few days he painted the small houses with thatched roofs and the equally picturesque church. He wanted to return to	painting portraits. Dr. Gachet was his first model in early June, and several others followed. At the invitation of Dr Gachet, Theo and Jo came to Auvers on 8 June and spent the day with Vincent. 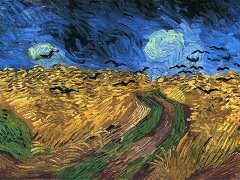 In several canvases he depicted the endless wheatfields around Auvers, among them, his swan song Wheatfield with Crows. On 6 July he visited Theo in Paris to discuss his brother's problems with Boussod & Valadon. On 27 July Vincent shot himself in the chest and died of his wounds with Theo at his side on 29 July. The funeral was held in Auvers on 30 July and among those attending were Pere Tanguy, Emile Bernard and Lucien Pissarro. Theo was to die six months later.